Henry Holt and Co., 9780805098310, 320pp. When June Melby was ten years old, her parents decided on a whim to buy the miniature golf course in the small Wisconsin town where they vacationed every summer. Without any business experience or outside employees, the family sets out to open Tom Thumb Miniature Golf to the public. Naturally, there are bumps along the way. In My Family and Other Hazards, Melby recreates all the squabbling, confusion, and ultimately triumph, of one family's quest to build something together, and brings to life the joys of one of America's favorite pastimes. In sharp, funny prose, we get the hazards that taunted players at each hole, and the dedication and hard work that went into each one's creation. All the familiar delights of summer are here—snowcones and popcorn and long days spent with people you love. Melby's relationship with the course is love-hate from the beginning, given the summer's freedom it robs her of, but when her parents decide to sell the course years later, her panicked reaction surprises even her. Now an adult living in Hollywood, having flown the Midwest long ago, she flies back to the course to help run it before the sale goes through, wondering if she should try to stop it. As the clock ticks, she reflects on what the course meant to her both as a child and an adult, the simpler era that it represents, and the particular pains of losing your childhood home, even years after you've left it. June Melby's work has appeared in McSweeney’s, LA Weekly, and National Lampoon Magazine, among other places. In 2011 she was a Writing Fellow at the Virginia Center for the Creative Arts, and in 2003 received the International Artist Award and residency from the City of Hamburg Kulturbehorde (Cultural Affairs Department). In 2002 she was the winner of the Children’s Poetry Award at the Edinburgh International Poetry Festival. She lives in Decorah, Iowa. 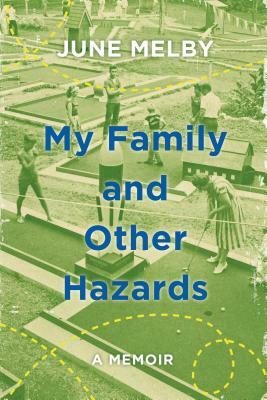 “I bet you've never picked up a memoir about miniature golf before now. Neither had I! But June Melby's deeply funny and endearing book goes far beyond novelty to tell an evocative story about memory, family, and the perfection of Midwestern summers.” —Wendy McClure, author of The Wilder Life: My Adventures in the Lost World of Little House on the Prairie.